The 6th Meeting of the Mycenaean Seminar. The Mycenaean cemetery of Deiras, excavated in the beginning and the middle of the 20th century, by W. Vollgraff and J. Deshayes, respectively, has not been studied enough, especially because of the lack of impressive grave goods, which would provide an opportunity for discussion on issues of social differentiation. The recent study of a group of unpublished finds from the Vollgraff excavations, which is kept at the National Archaeological Museum and consists mostly of gold jewellery, as well as a re-examination of the material from the Deshayes excavation, has led to a reconsideration concerning the chronology of the cemetery, its material wealth, contacts with other areas, and the gradual adoption of Mycenaean burial customs by the local population. According to the results of the new study, the cemetery of Deiras was established during the LH IIA period. Until LH IIIA1 it remained a privileged burial ground for social groups with access to important trade networks, co-existing with earlier cemeteries in the southern slopes of the Aspis hill. Deiras became the main cemetery of Argos only in the LHIIIA2 period, and remained so until the LHIIIC period. A comparative assessment of the cemetery with reference to other cemeteries in the Argolid, leads to the hypothesis that it was during the LH II-IIIA1 period that a common code of funeral behavior was actually created on the mainland, a code which put emphasis on rituals taking place before the entrance of the tombs and promoted material wealth as an indicator of social distinction and communal social identity. 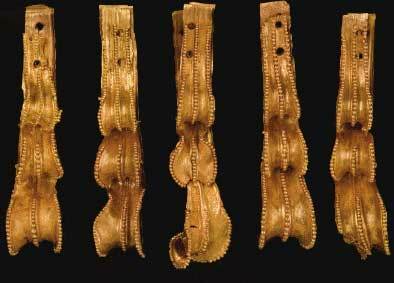 This research focuses on one more aspect of Late Helladic culture: the technology of the different materials (especially gold), methods of manufacture and the study of the objects through microscopic observation and experimental applications (a film will be shown on the subject).